If it lives underground, then chances are we can build and protect it, find it, access it, fix it, or improve the way it works for you. 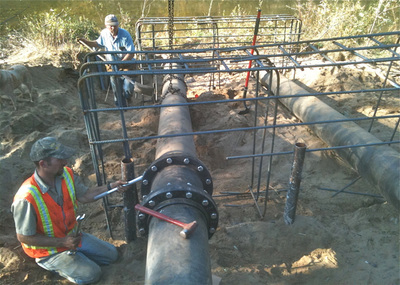 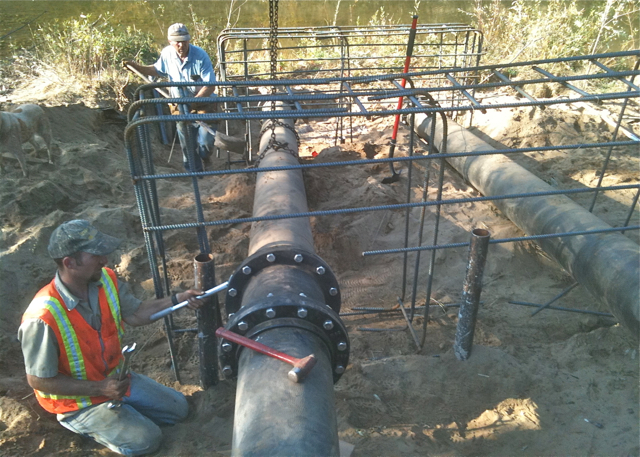 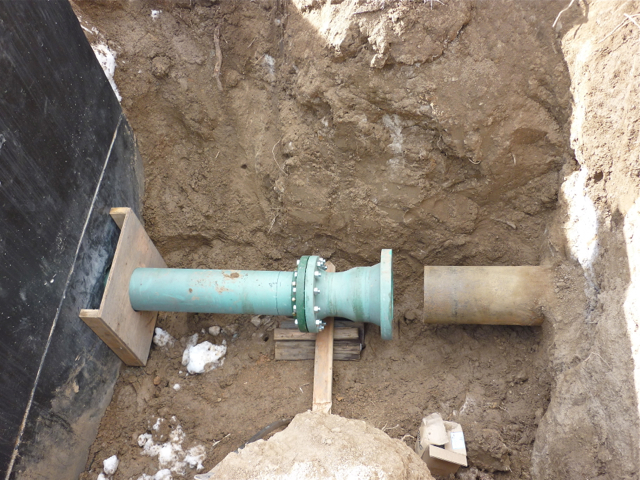 We are used to working with pipes, valves, vaults, and their bedding, marking, or locating. 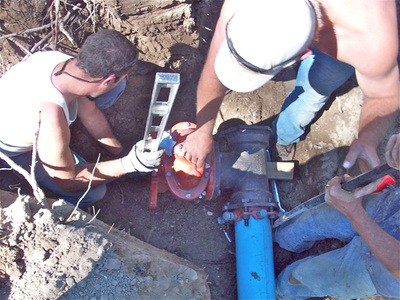 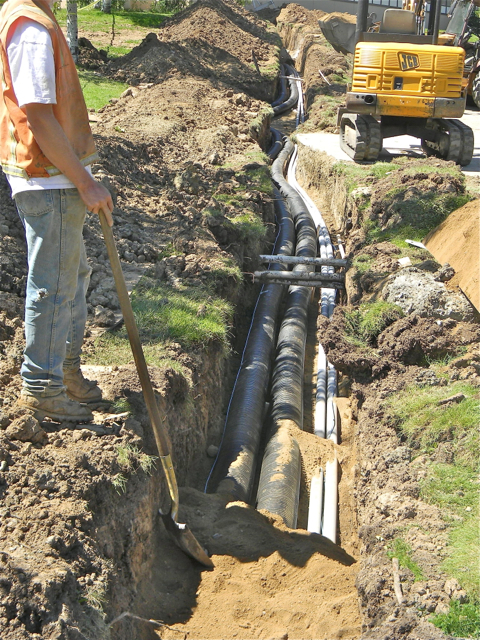 We deal with pressurized and gravity drainage pipes and are trusted by the utilities we work for in the area. 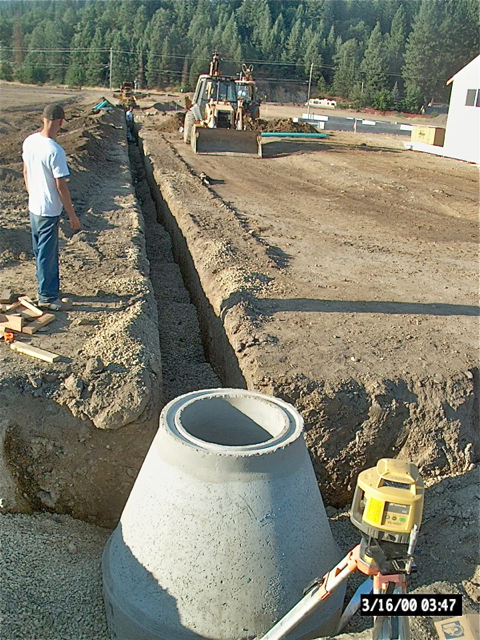 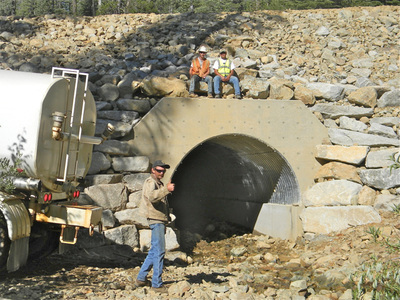 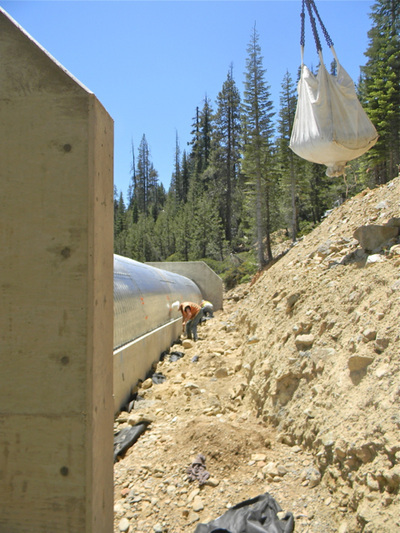 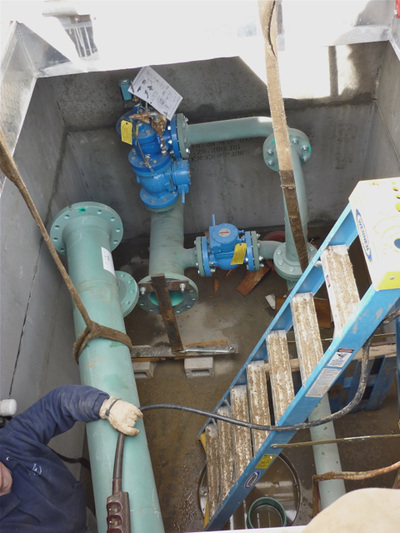 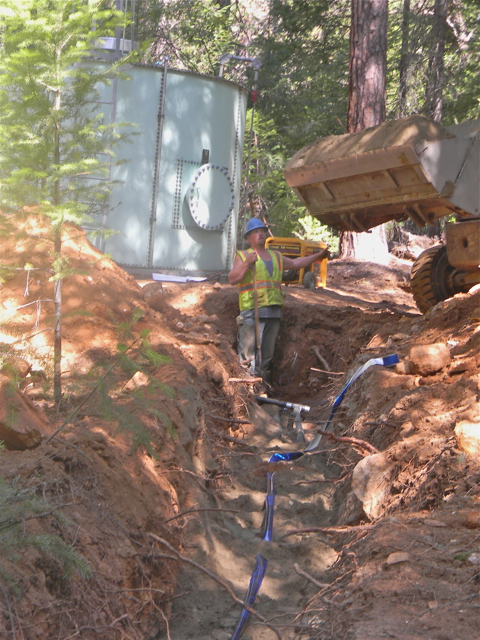 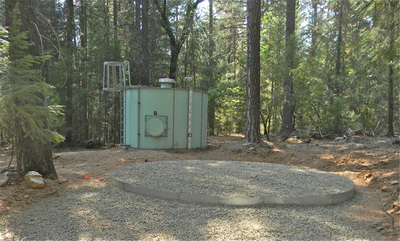 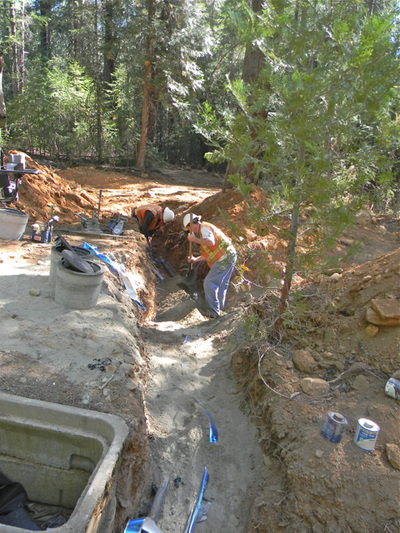 At left: Wilburn installs a pressure reducing system for the City of Portola, CA that takes gravity-pressured 300psi drinking water down to 75psi for local distribution. 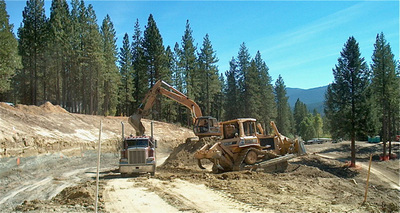 ﻿The photo galleries below will provide captions with enlarged images. 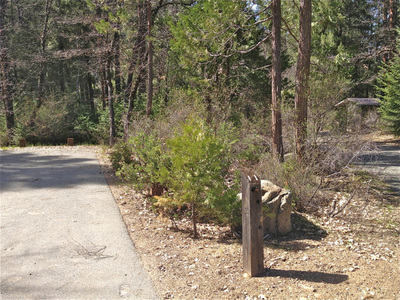 Simply click on them and then use < or > arrows to advance or retreat within each set. 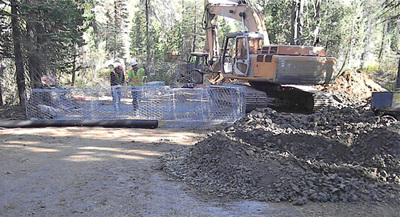 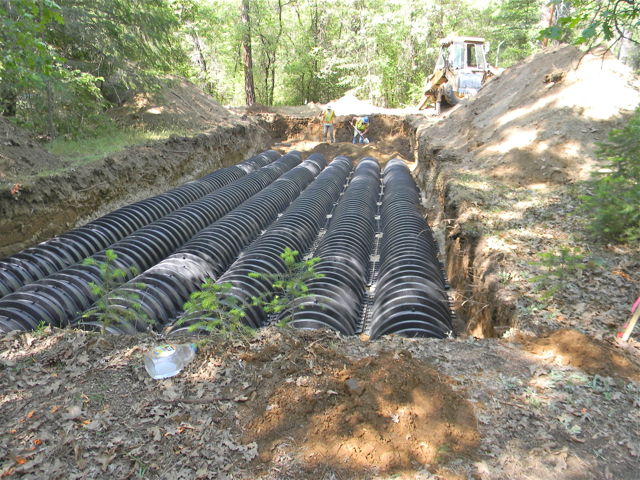 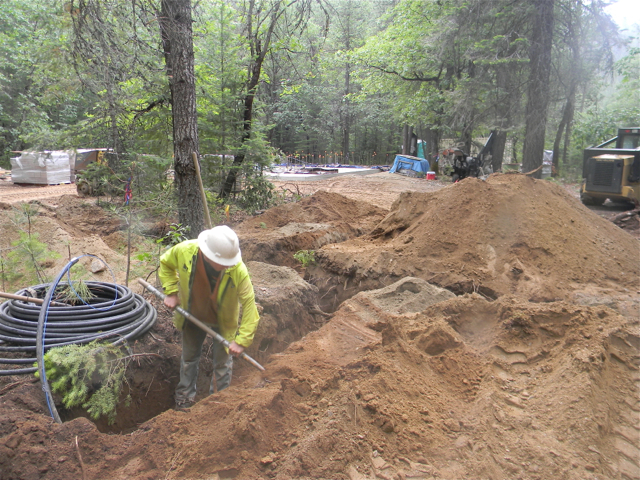 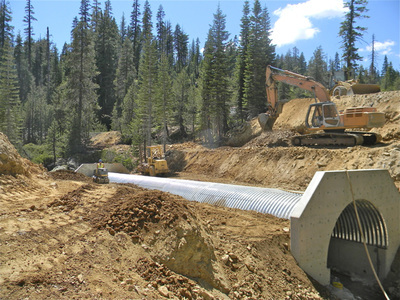 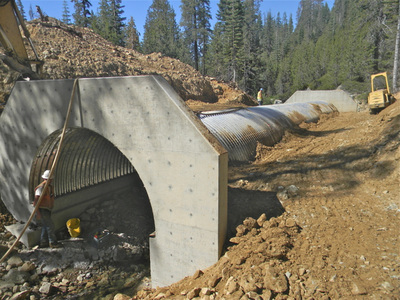 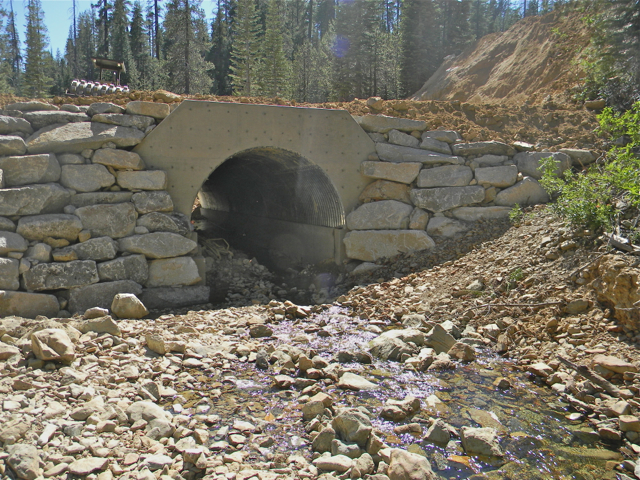 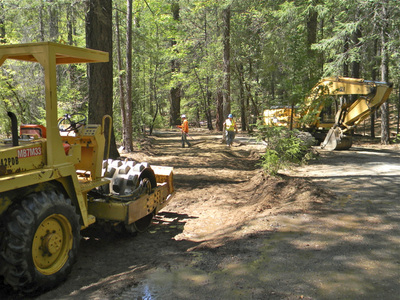 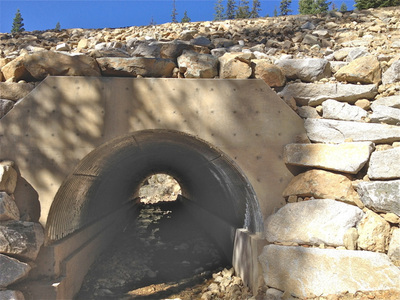 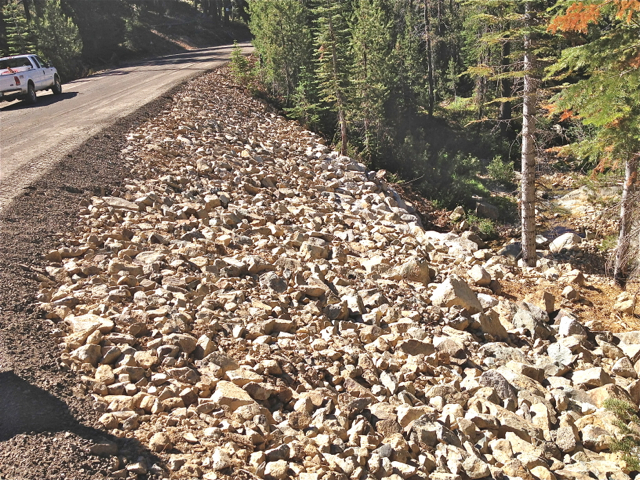 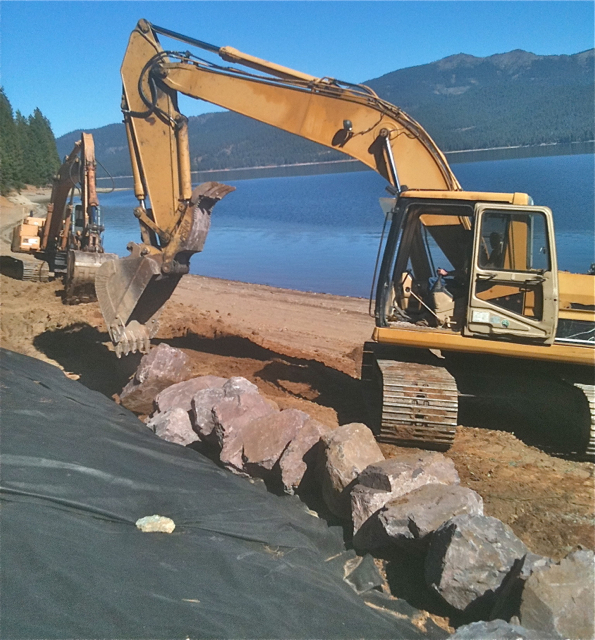 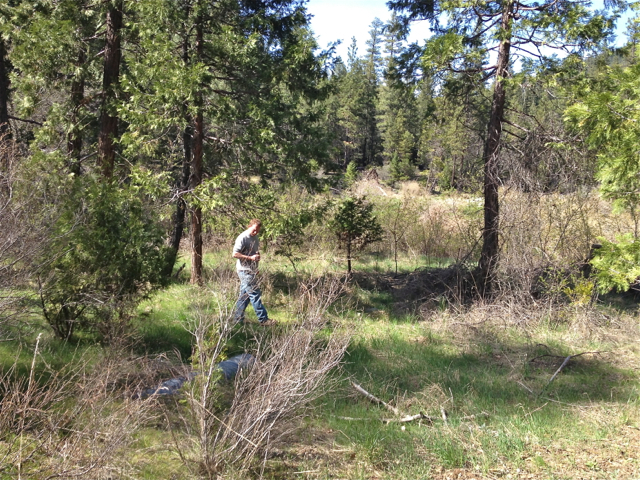 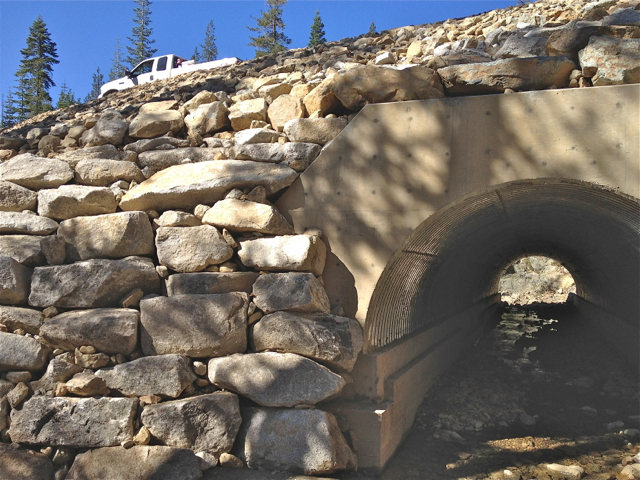 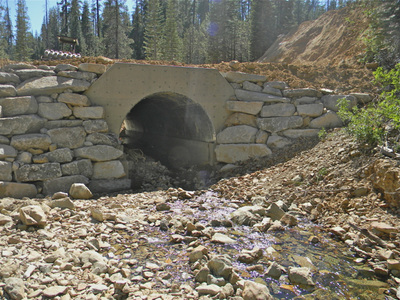 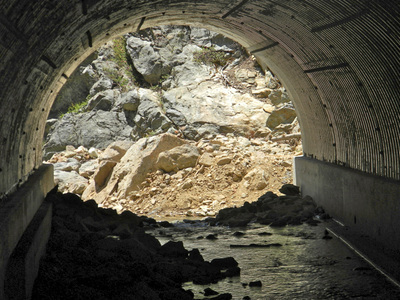 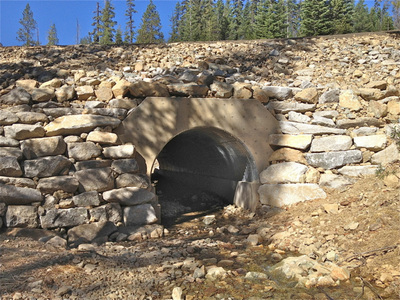 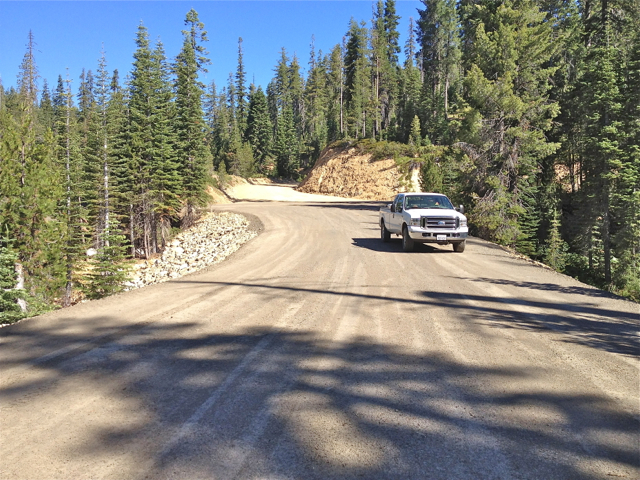 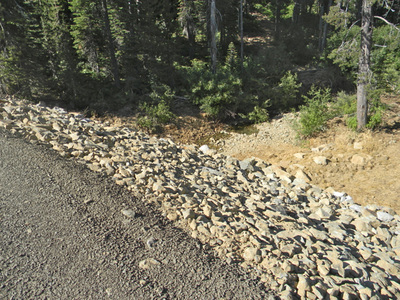 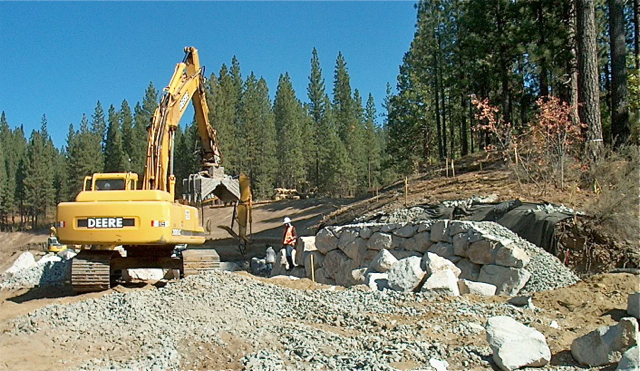 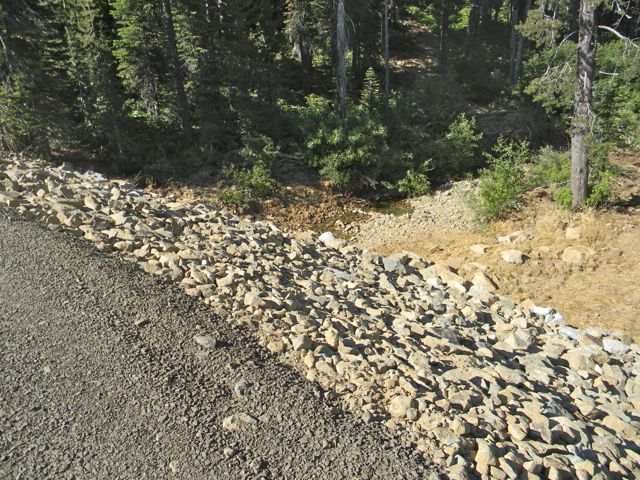 An environmentally-sound approach called an ﻿"Aquatic Passage"﻿ was requested by the U.S. Forest Service as the appropriate retrofit, and Wilburn went to work. 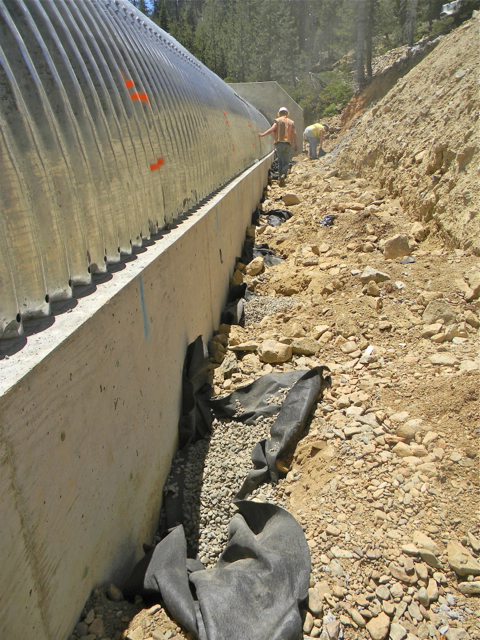 The engineered solution was to construct the bottom of the passage as a wide, flat expanse bounded by concrete retaining walls. 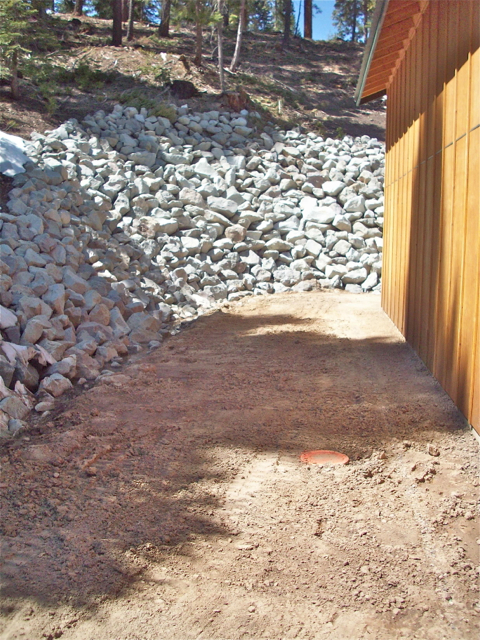 Between them, an artificial stream "bed" was created with boulders, rock, and gravel that at low water would closely mimic the natural features and fall of Coldwater Creek both above and below the structure. 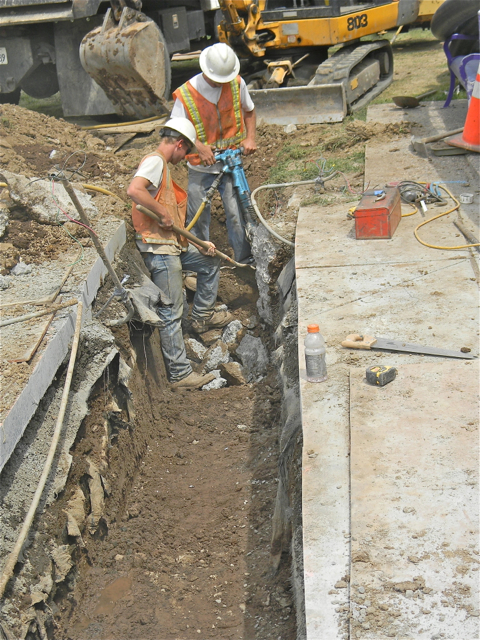 A "half-culvert" of arched plates anchors to the top edge along each retaining wall and was then carefully buried and compacted before the gravel roadway (above) was restored. 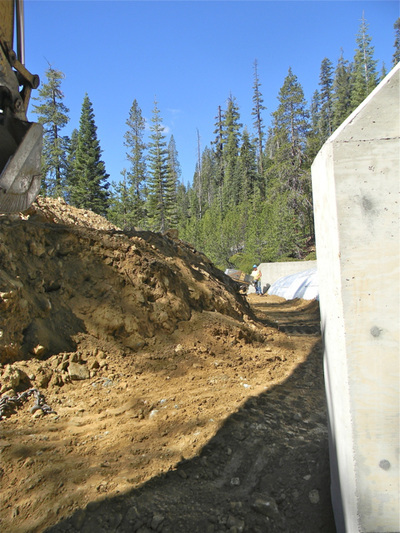 Controlling the pitch of this 80-foot passage is expected to let fine sediments move through without building up ahead of, inside, or downstream of the structure. This will keep water flowing in the bottom of the passage where it can continue to ease the passage of fish and amphibians during low water periods. 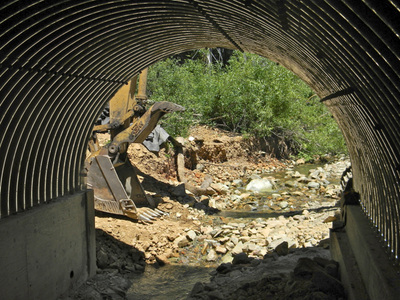 In higher water, passage is not a problem for fish. 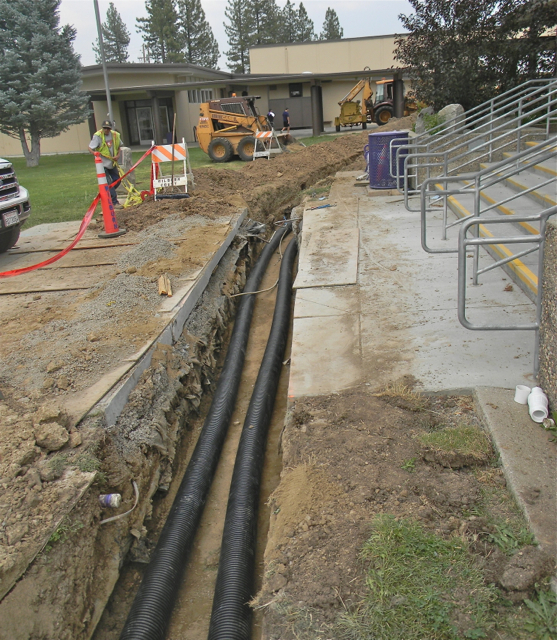 When school facilities tire out or get expanded (or retrofitted) there is often a need to run new pipes from one place to another. 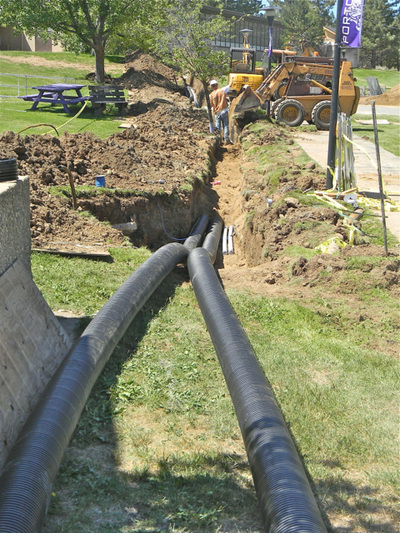 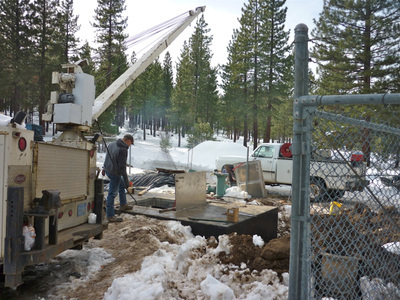 In this case, Portola High needed a new hot water piping run across their campus for 300 feet, connecting their boiler to heating equipment in other buildings. 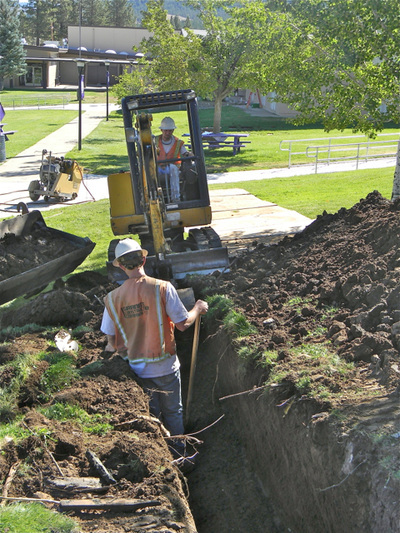 The only path involved cutting through walkways and avoiding other pipes that cross the new path. 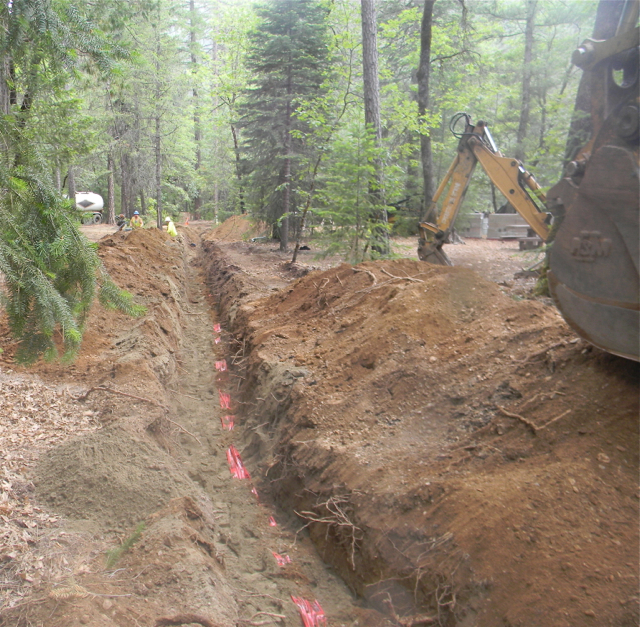 A new boiler supply and return line was placed in the new trench along with a couple of spare electrical conduits for control wiring or other future needs that could be quickly pulled in without further underground disturbance. The large, black pipes are actually smaller hot water conducting lines sandwiched in the middle of about three inches of dense foam insulation for heat retention. 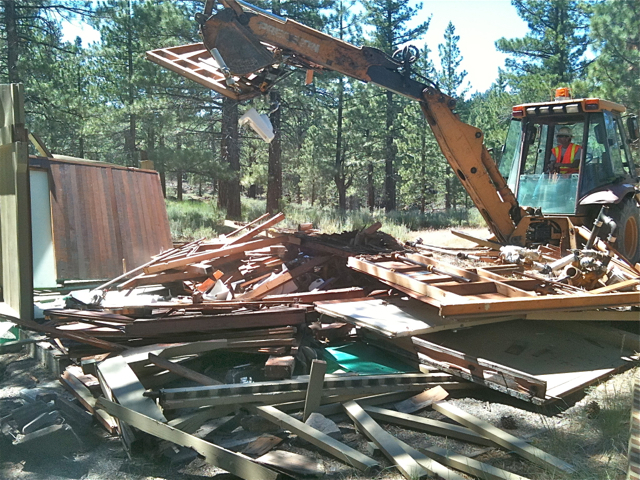 The outer sheathing is a non-reacting polyethylene sheathing. 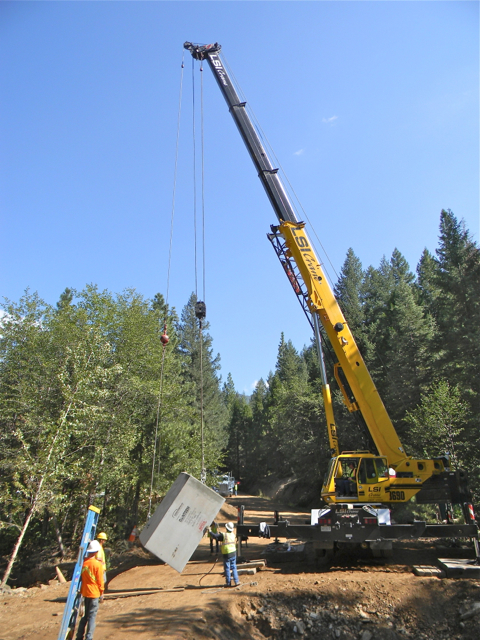 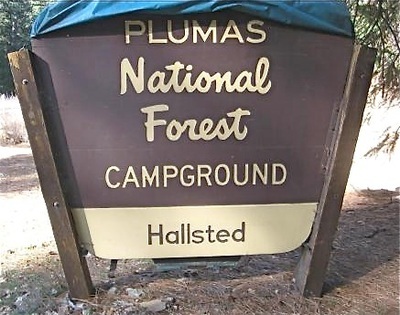 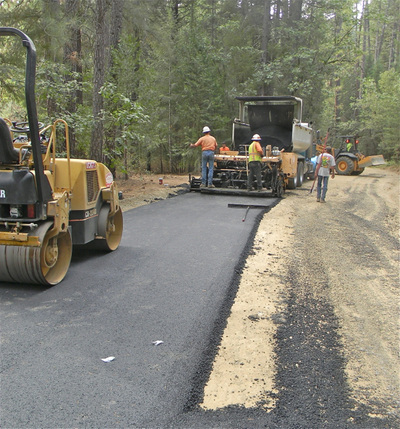 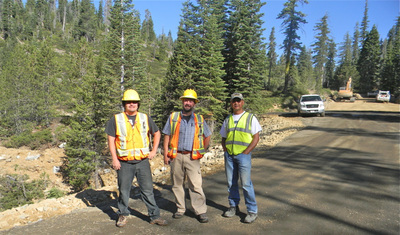 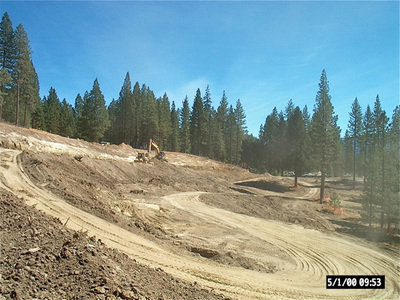 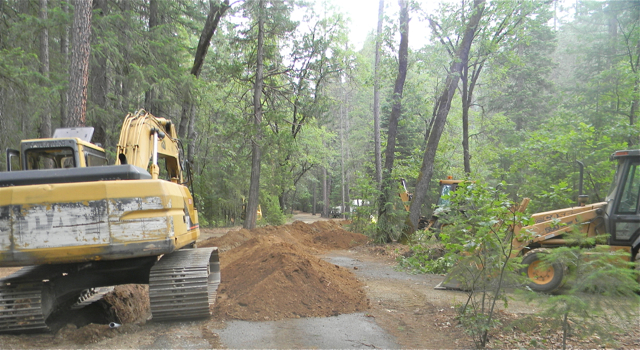 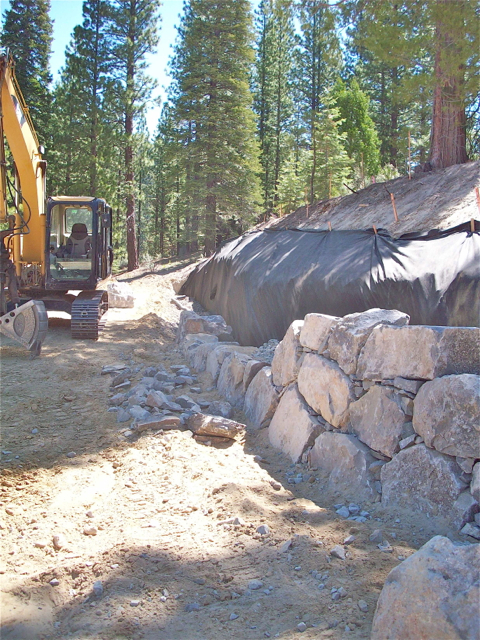 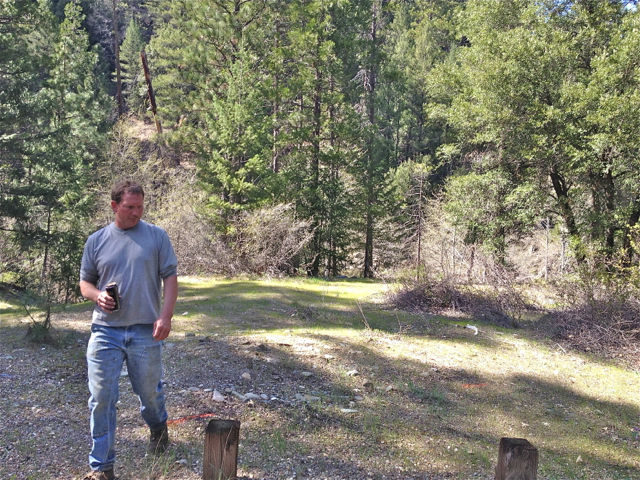 The Plumas National Forest has undertaken efforts to improve campground facilities in the three season area of the Feather River Canyon to accommodate more travelers while minimizing environmental wear and tear. 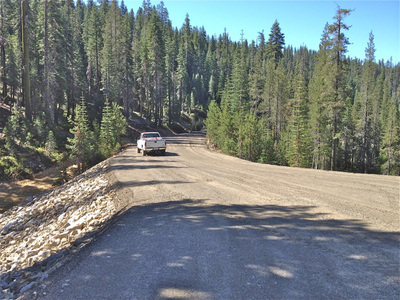 Wilburn Construction has been a part of this effort, widening and paving loop roads for larger RVs, installing underground electricity in some units, and re-habilitating water lines and storage. 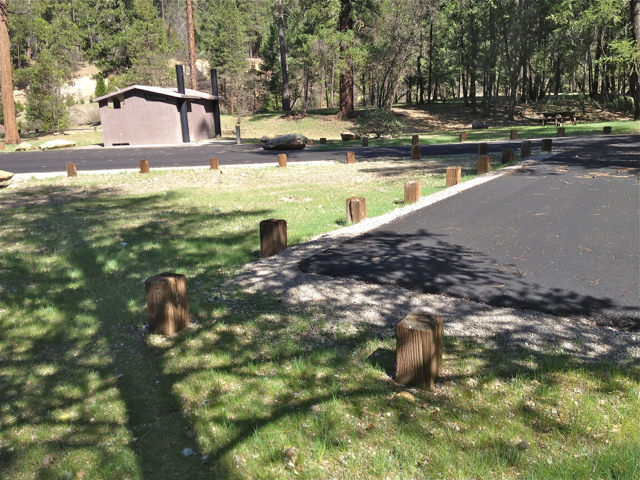 Featured below are photos of the first of these retrofits at Hallsted Campground, near the town of Twain. 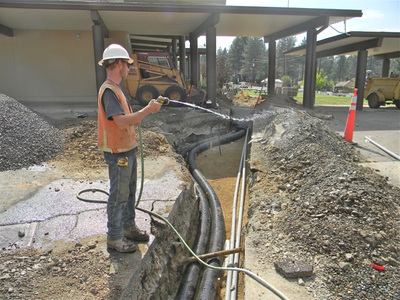 This last gallery represents a miscellaneous assortment of Wilburn underground construction projects in our working area.